If you're new to Working at Homeschool, I have lots of meal ideas here! For example, check out $7 THM Dinners HERE). 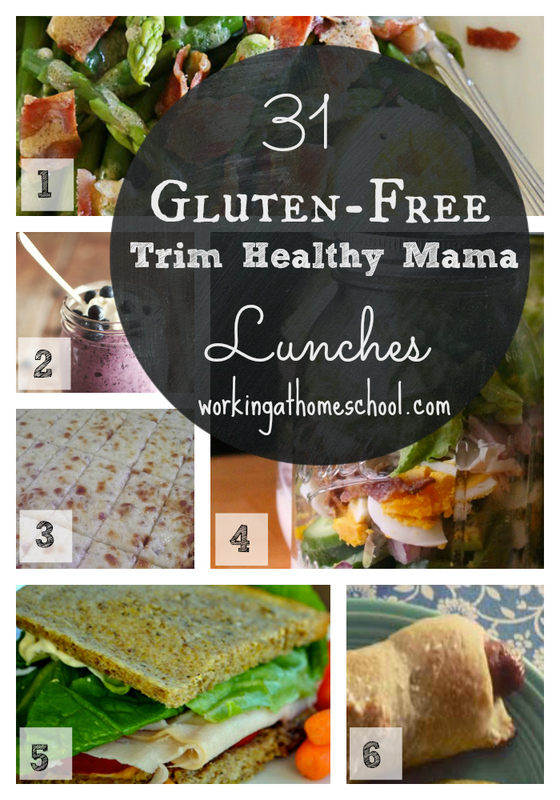 Here are 31 gluten-free Trim Healthy Mama lunches, with a free printable at the bottom of the post. Since I wrote this post, I added two new lunch recipes of my own – LOVE THESE! THM Pasta Salad (which can be made GF by substituting the noodles) and Easy Black Bean Chicken Salad (secretly my favorite). So really, this post contains 33 THM Lunch Ideas! 6. Pretzel Dogs (E, but please make sure you use a low-fat turkey or chicken dog!) from GwensNest.com; to make a gluten-free corn dog follow the directions at Satisfying Eats. 12. Joseph’s Pita Pizza (S) (THM book). For GF option, make Fooled Ya Pizza Crust (THM book), OR substitute very thinly sliced chicken breasts for the crust. It sounds weird, but if you make them thin enough you can get a crispy pizza “crust”. 20. Antipasta Platter (S) I usually choose just a few items from FoodNetwork.com to make my plate. My favorite is a few slices of salami, a few slices of cappicolla ham, fresh mozzarella, and a few olives. 21. Taco Bowl (S) from MarksDailyApple.com. I usually use leftovers to make different variations of this if I don't feel up to making kale chips. 31. Greek Quinoa Salad (E) from SkinnyTaste.com **note: To keep this an “E”, I use only 5 kalamata olives sliced thinly instead of 10. That way the fat is reduced, but you still get a little of the olive taste. This is a favorite! I know this is avocado-heavy, but hey! It's that time of year! Just remember that for Trim Healthy Mama, avocados are acceptable in an “S” setting, and at 1/2 an avocado per serving. If you don't like avocado, you can omit it in every recipe except for the egg salad. As usual, most of these lunches are Paleo and Candida diet friendly, too! I have all of the pinnable recipes pinned on my Pinterest board to make it easier, but some of them require tweaks so make sure to check this page for the recipe and modifications, if needed. If you like this, please share it! This blog is a labor of love that I don't get paid for, so my “payment” is seeing that people are blessed by this work — I LOVE seeing the “shares” on Facebook and Pinterest! Thank you for coming by! 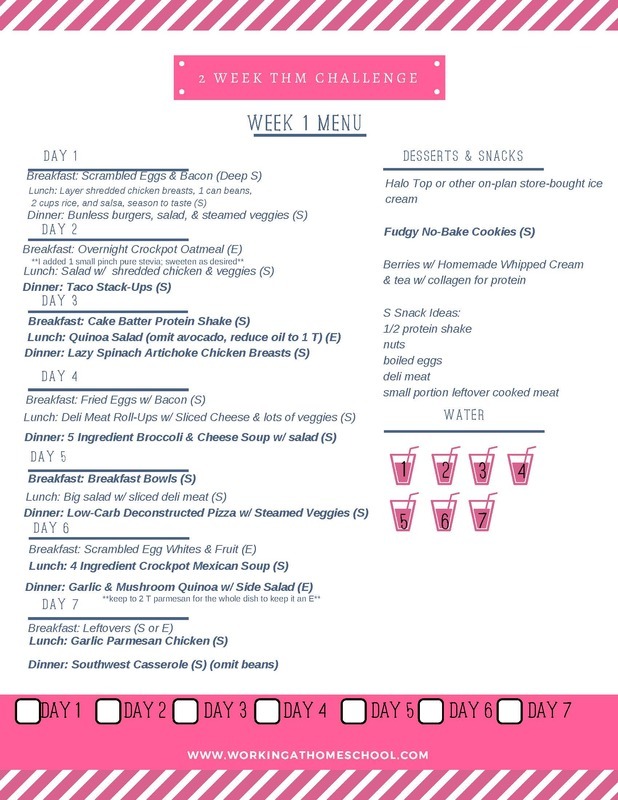 I also have 31 Gluten-Free Sugar-Free Trim Healthy Mama Snacks, 31 Days of Gluten-Free Trim Healthy Mama Meals for April/May, and more menus and shopping lists! Thank you SO much. My dr just told me to go gluten free and I’ve been very reluctant – especially with 3 kids at home. This is a great place to start. Thanks for coming by, and for your comments! I really enjoyed hearing from you. There are tons of Gluten-free recipes available, and I’m always looking for new ones! I’ll keep sharing them as I find them! If you click on the link, you’ll see it in the Pinterest comments. Sorry I didn’t specify which comments it was posted in. Sure! I can see it, I’m not sure what the problem is, sorry! Here’s the recipe: You’d never guess that there is no fat in this mix!! Eaten alone, this Creamy Fiesta Chicken is a fuel pull. With the wraps, you’ll get a good “E” meal. (This is the THM Pan Bread recipe from the book, but I tweak it with 1 Tbsp Flax Meal and 1-2 Tbsp. Nutritional Yeast for a “nutty”, bread-like flavor. You could even add some spice to the basic Pan Bread recipe, and mix it up a bit!) Recipe for Creamy Fiesta Chicken-1 can drained Chicken Breast, sautéed with half of a sliced onion, one sliced Bell Pepper, (I added mushrooms), Diced Tomatoes or a good handful of cherry tomatoes, seasoned with Onion Powder, Garlic Powder, (or use fresh/crushed), Crushed Red Pepper or anything spicy, Cumin, Salt, Pepper, Cilantro. Add 1 whole squeezed lime, 1/2 cup Non Fat Greek Yogurt, heat it through, and serve in a wrap or on it’s own. You’d never guess that there is no fat in this mix!! Eaten alone, this Creamy Fiesta Chicken is a fuel pull. With the wraps, you’ll get a good “E” meal. (This is the THM Pan Bread recipe from the book, but I tweak it with 1 Tbsp Flax Meal and 1-2 Tbsp. Nutritional Yeast for a “nutty”, bread-like flavor. You could even add some spice to the basic Pan Bread recipe, and mix it up a bit!) Recipe for Creamy Fiesta Chicken-1 can drained Chicken Breast, sautéed with half of a sliced onion, one sliced Bell Pepper, (I added mushrooms), Diced Tomatoes or a good handful of cherry tomatoes, seasoned with Onion Powder, Garlic Powder, (or use fresh/crushed), Crushed Red Pepper or anything spicy, Cumin, Salt, Pepper, Cilantro. Add 1 whole squeezed lime, 1/2 cup Non Fat Greek Yogurt, heat it through, and serve in a wrap or on it’s own. This is an incredible site~ you have done SO much leg work and offered it here for free!! Thank you! Question about the Pretzel Dogs~ did I miss how you make these GF? They sound great, and so does the bread, but I didn’t see notes about changing to GF.